Christine And The Queens just does pop differently. 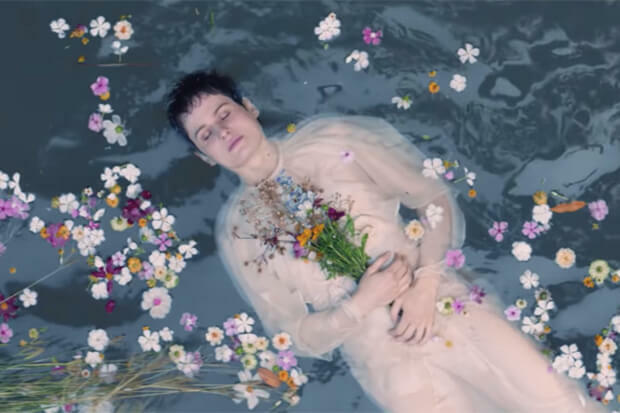 From the music to the visuals, the French singer takes a breathtakingly original approach. Take the video for Chris highlight “Comme Si.” How often does a pop star reference Shakespeare in their work in 2019? “In Hamlet, Ophelia is, of course, the unlucky lover, the rejected one; but her madness and the suicide that ensues is also symptomatic of a whole era: the young girl, unwanted, unloved, simply cannot live,” she explains. The “Girlfriend” hitmaker decided to give the play a modern, feminist spin in her “Comme Si” visual. “Let’s bring Ophelia back from the dead, to express her desire and madness with exhilaration, as something that elevates her, instead of pushing her to the shores of death,” Christine muses. “What if it was time to tell a new story, one that brings us more ecstasy than the one we are used to being told?” It’s a lofty goal, but one she achieves with flair in the David Wilson-directed clip. Watch it below.